The American Library Association’s Office for Intellectual Freedom (OIF) is asking for anyone who has knowledge of censorship attempts in 2018 to submit reports before the end of the year. Anyone can report a censorship incident, including challenges and bans, and the incidents are not restricted to books. Make a report if you know about an attempt to censor databases, displays, public speakers, programming, and art. OIF tracks challenges throughout the year and provides confidential support to educators facing censorship attempts. 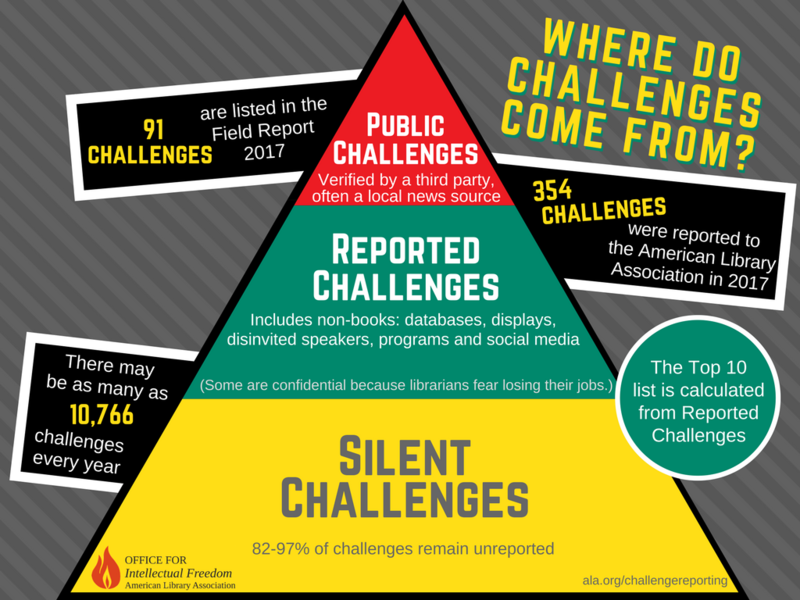 Reporting challenges that occurred from Jan. 1 – Dec. 31, 2018 will help OIF identify censorship trends, craft resources, and provide updated information for the annually published Top 10 Most Challenged Books data. You can report challenges to Kristin Pekoll, the Assistant Director of OIF, by phone (312 280 4221) or email. Pekoll is also hosting a Facebook Live event on December 12th entitled Reporting Censorship with OIF designed to extol the virtues of, you guessed it, reporting censorship. The event will go over a variety of ways people can report challenges, the information that helps the OIF, and the professional responsibility library workers have to fight against attempts at censorship. If interested, tune in at 12pm Central on Wednesday, December 12. While the focus will be on library workers and educators, all viewers are welcome if they’re interested in learning more about the OIF and tracking censorship. Don’t forget if you are currently experiencing censorship, you can always reach out to CBLDF for help and advice. For more information on recruiting CBLDF to see if we can assist with your current fight for free expression, email us, or call us at 1 800 99 CBLDF. 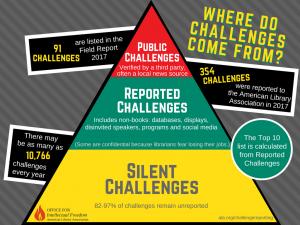 For those that have already faced a censorship challenge this year, please submit a report to the ALA OIF if you haven’t already. The information they track helps us see where what problems are happening where, and is invaluable to us in our fight for the First Amendment.